Such a beautiful unit - and yet no finials. Yes, I know. It's very tiresome not to have them but now is the time to picture them and their absence only detracts a smidgen. 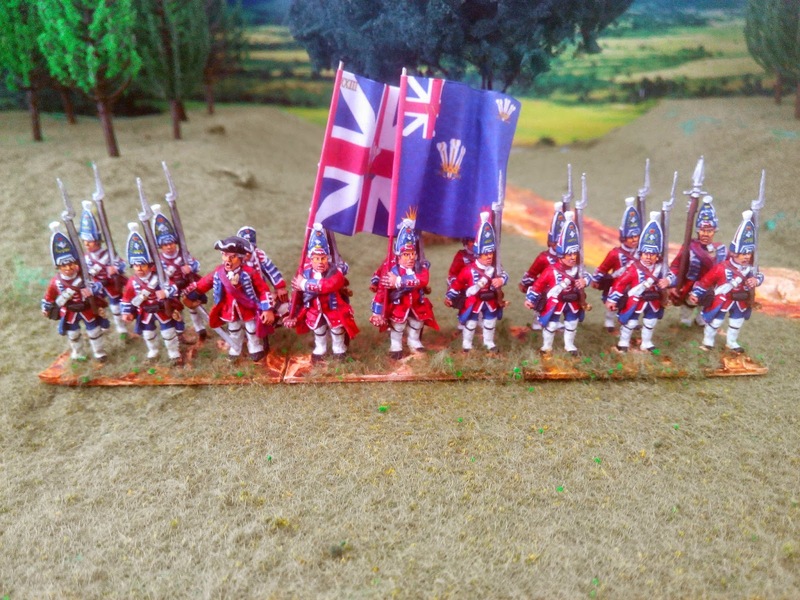 I'm doing 8 battalions of British reinforcements to serve under Prince Ferdinand and you have already seen five of them - the Guards Brigade and the Highlanders. To follow are two more converged grenadier battalions. 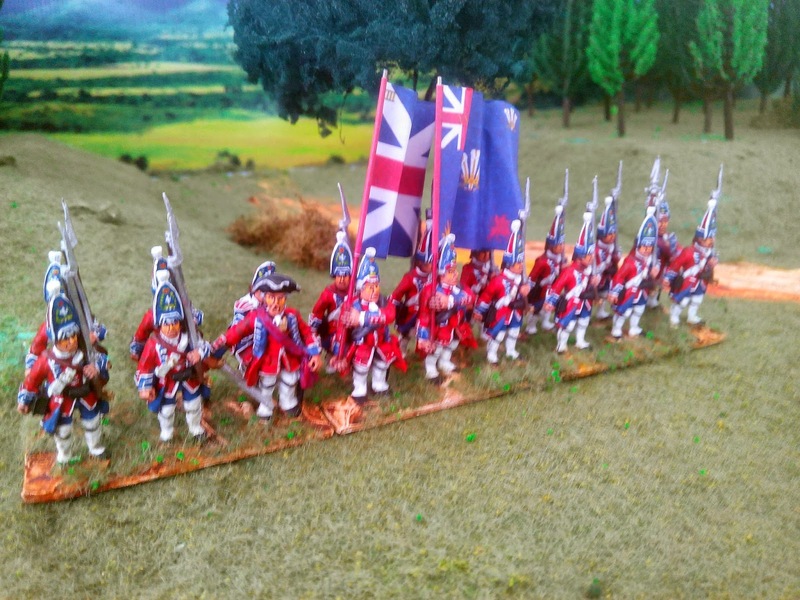 Meanwhile, here is the history of this very fine regiment from Kronoskaf. The regiment was formed in 1689 as Lord Herbert's Regiment by Henry, Lord Herbert of Chirbury. Although designated as the Welsh Regiment of Fusiliers in 1702, it has always contained men from all over Britain. In 1694 under Colonel Ingoldsby, the regiment was moved to Flanders. There it won its first battle honour at the siege of Namur in 1695 where the regiment suffered casualties of 92 dead and 123 wounded. The regiment's part in the siege remains unclear but the casualty figures suggest that it lead the assault. The regiment was selected, during the War of the Spanish Succession, together with an English and Scottish regiment, to become "Fusiliers" for the purpose of guarding the artillery train. The fusiliers all wore mitre caps; originally, these mitre caps were ordered to be lower than those of the grenadiers but this distinction was soon lost. The second battle honour was won at Blenheim. 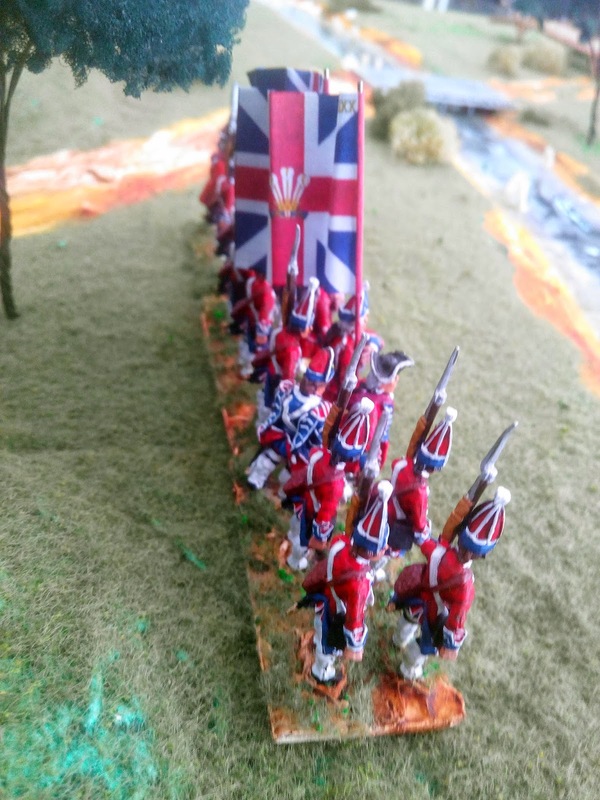 There, as part of the five brigades leading the attack under the command of brigadier Rowe, the Welsh and Scots Fusiliers were ordered not to fire a shot until Rowe had struck the palisade with his sword. Their attack was repulsed but they reformed, attacked again and with help from a cavalry attack on the centre won the day. The Welsh Fusiliers lost 9 officers and 120 other ranks. The first reference to the regiment as "Royal" occurs in 1712 and the following year, the cumbersome title of "Prince of Wales's Own Royal Regiment of Welsh Fusiliers" was granted by George I in recognition of the bravery and loyalty of the regiment. At this time it was granted the privilege of wearing the Prince of Wales's Feathers and the Badge of the Rising Sun on the Regimental Colors. When the War of the Austrian Succession erupted, the regiment again went to Europe. At the battle of Dettingen on June 27, 1743 the regiment participated with honor defeating three French regiments including the famous regiment of Navarre. In commemoration, the regiment was allow to include the badge of the White Horse of Hanover to their colors. Under the command of the duke of Cumberland, the regiment was very badly mauled at the battle of Fontenoy in 1745 when it attacked a very strongly fortified position. Although twice successful in breaking the French line, the position was untenable and with losses of 323 men, the regiment was forced back. Later in 1747 at Lauffeldt, the duke of Cumberland again was defeated. This time, the regiment was run down by its own cavalry and subsequently attacked by French infantry resulting in 240 men being lost, most of whom were prisoners. On July 1 1751, the regiment officially became the "23rd Regiment of Foot (Royal Welsh Fusiliers)" while garrisoned in Scotland. 1754 found the Royal Welsh bound for duty in Minorca. In 1756, at the outbreak of the Seven Years War, the 23rd Foot was one of four British regiments that unsuccessfully defended Minorca against forces commanded by the duc de Richelieu. After the capitulation of Fort St. Philip on June 28 1756, the regiment was allowed to retire to Gibraltar. The regiment then returned to Great Britain where, on September 20, it received a second battalion. In May 1758, the regiment was sent to the Isle of Wight and then, from June to July, took part to a fruitless expedition against the French Coast, returning to the Isle of Wight after the expedition. While encamped on the island, the regiment was ordered to embark for Germany. It was among the first British contingent (6,000 men) sent to reinforce the Allied army of Ferdinand of Brunswick in Germany. The contingent embarked at Gravesend on July 19 and disembarked on August 3 at Emden. It then left for Coesfeld where it arrived on August 17 after marching through a very heavy rain. In June 1759, the regiment was part of the main Allied army under the command of the duke Ferdinand of Brunswick. 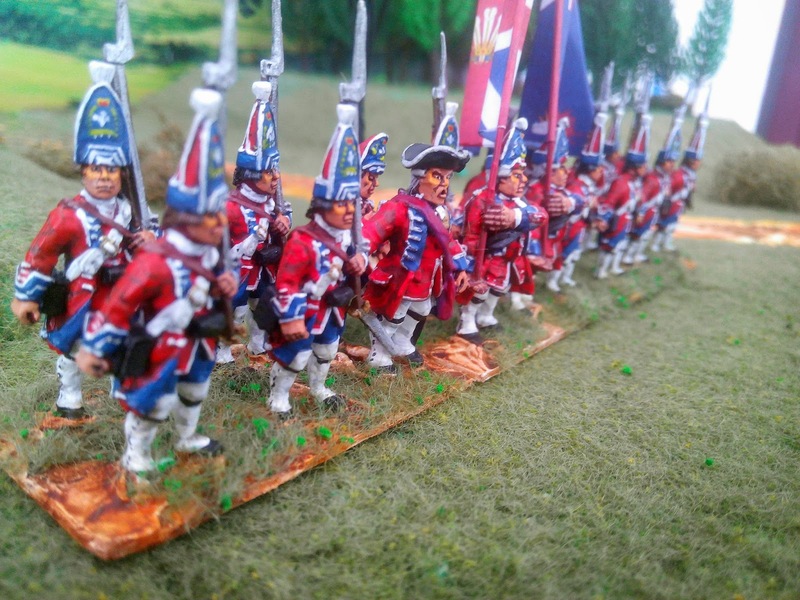 The grenadiers of the regiment were converged with those of the 12th Foot, 20th Foot, 25th Foot and 51st Foot to form Maxwell's Grenadiers Battalion. On August 1, the regiment took part in the battle of Minden where it was deployed in the first line of the 3rd column under major-general Waldegrave alongside the 12th Napier's Foot and the 37th Stuart's Foot. Misinterpreting orders, Waldegrave advanced straight upon the cavalry deployed on the left of the French centre, supported on its way by the fire of Philip's Artillery battery. The first line of French cavalry (11 sqns) charged Waldegrave's first line but was thrown back. The second line of French cavalry was equally repulsed though with more difficulty. Now the French reserve, consisting of the Gendarmerie de France and the Carabiniers, attempted a third attack upon the 9 brave battalions. It charged and broke through the first line of Allied infantry. However, the second line received them with a deadly fire and forced them to retire. The astonishing attack of the British infantry had virtually gained the day. On October 16 1760, the regiment fought in the battle of Clostercamp where it formed part of the 4th division under Howard which was kept in reserve. In July 16 1761, the regiment was in Howard's Corps and took part in the battle of Vellinghausen. On June 24 1762, the regiment took part in the battle of Wilhelmstal. The unit later participated in the American War of Independence and was sent out to the American Colonies in 1773. When the rebellion erupted in Boston, the unit took part in the battles of Lexington and Concord. As the War progressed, the 23rd Foot took part in many of the major battles. These battles included Bunker (Breed's) Hill, Germantown and Camden before the unit surrendered at Yorktown in 1781, but not before the Colours had been smuggled out and only the cased flagpoles surrendered. Their heroism at Yorktown was so admired by the opposing forces, and the fact that so few men had held out for so long, that the Fusilier Redoubt that they held along with a detachment of Royal Marines still stands as a memorial to them.